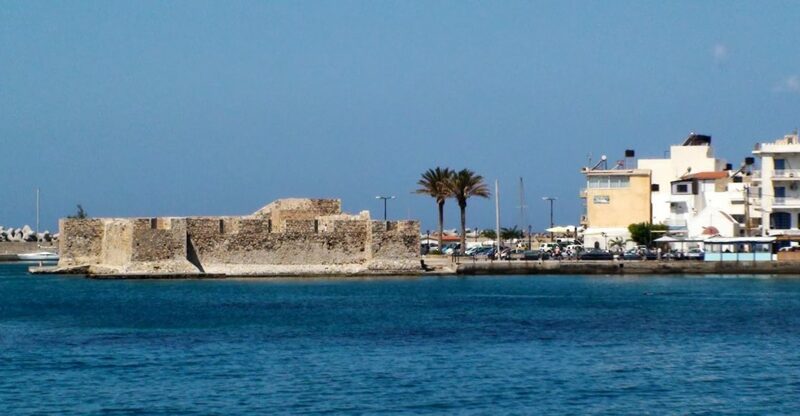 Favoured both by position and by nature, Ierapetra has always been an important centre of the island. It has grown into the largest town in south Crete and a major tourist destination. When you visit it you will find a lively, active town – much more so than Agios Nikolaos or Sitia. Ierapetra is a town which has everything in abundance, but the one thing you won’t need here is an umbrella, since it rarely rains. According to the experts, the mountains of West and Central Crete act as barriers, stopping the clouds on their way to Ierapetra. Ierapetra is one of the most fertile areas in Greece, and therefore one of the most productive. Its inhabitants mainly cultivate greenhouse fruit and vegetables, exporting them to many European countries. The list is a long one, but until recently Ierapetra was not one of the most attractive towns in Crete or Greece. In recent years, however, there have been efforts to prettify it. The restructuring of the coastal road has indeed improved it a great deal, making it ideal for a stroll and somewhere to sit for lunch or an evening drink with a view of the sea. The town of Ierapetra has pretty corners to discover, making you forget that you’re in a busy place with a slight traffic problem and the general hustle and bustle of a town in constant motion.